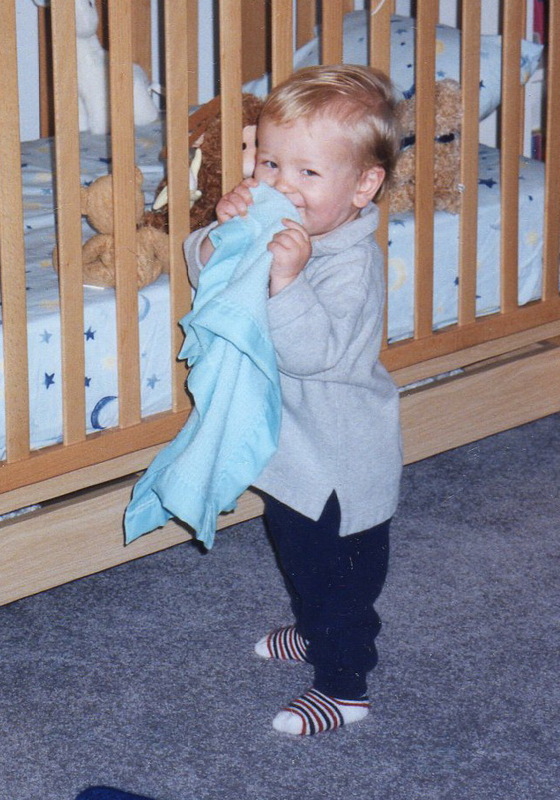 Most of us, as young children, had a beloved item that brought us great comfort. It could have been a traditional teddy bear, a doll, a blanket, or even an old tshirt. Whatever it was, it was a source of comfort at night, or when we were upset, and was our companion wherever we went. I had a stuffed bear. He was not especially soft and cuddly — he had a fairly hard body, jointed legs and arms, and he wasn’t traditionally cute (a factor my brother used to like to point out to me regularly.) But he was Teddy, and I loved him thoroughly. So thoroughly, as a matter of fact, that several times my mother had to replace the felt on the pads of his feet and his mouth. My son seemingly inherited my penchant for stuffed/plush critters. He had many while he was young, and frequently a chosen one would join us on family outings and trips. But the tr uly most beloved and cherished of all his belongings were his two small blankets, which we ever-so-creatively named Blue and Green. Throughout his toddler years, Blue especially would go everywhere with him. At any moment that he needed a touch of reassurance or comfort, he would bring one of the blankies up to his nose — it became a movement he made without even thinking about it, almost as second nature as taking a deep breath. 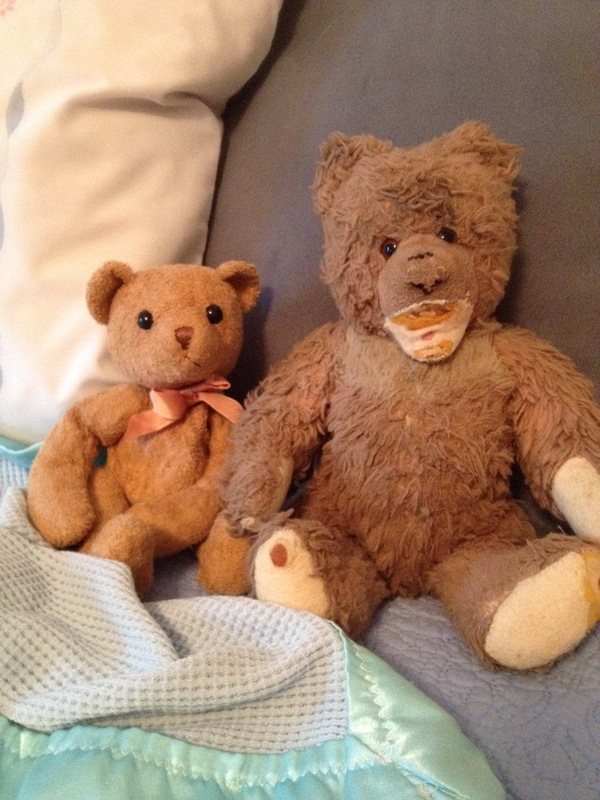 As is true with many of us who hold on to cherished items, I still have Teddy. He currently resides on a top shelf in my son’s closet, next to a few of his early cherished plush friends and Blue and Green. I noticed these old friends the other day while cleaning, and I started thinking about how we seem to outgrow the need for these sources of comfort. But do we really? Or do we just learn to seek out our sources of reassurance and comfort in other ways? Perhaps as we age, we seek comfort in places, people, and experiences. Certainly we find comfort in our spouses and partners. But where else, or how else, do you feel most at ease? Do you have a little niche place in your home that is your “me” spot? How about the people in your life? Are there a chosen few with whom you can truly just relax and be yourself and feel completely at ease? Is there an activity you do that brings you comfort? Do you have a pet who melts away your stress? I hope all you other Real Women out there are not offended by what I’m about to say…. I believe that we Real Women, no matter how strong, intelligent and self-assured we are, need a few little “somethings” that bring us back to that same safe, warm, comforted zone we experienced as children. No, I’m not proposing we all dig out our dolls and teddy bears and bring them to work with us. But certainly we should all make time at least once a week to escape to that comfy chair under a blanket, or connect with that BFF soul mate, or sit quietly with your cat in your lap and recharge….it doesn’t matter what that “something” is, and it is secret and personal only to you. But in that zone, we can breathe easy, let our guards down, and feel comforted. Then we can put our Big Girl pants back on and go back to saving the world. This entry was posted in family and tagged assurance, BFF's, comfort, safety. Bookmark the permalink. Most interesting.. funny I remember yours and David’s bears vividly, and mine is well worn, but I have no memory of carrying it around !! Now Davis’ “Guy” total memories!! As for now, special pieces of jewelry make me feel complete– not all the fun stuff I wear, but my wedding ring, and my silver link bracelet.. with those I can go anywhere! !